It’s National Smile Power Day, and My Heart Smiles would like to give you some good news to smile about!! Here’s a free gift for you to make your heart smile! Brighten your day! Go to my website! Read it! Download the PDF for FREE! Share it with everyone you know! Give the world some humongous hugs and sunshine smiles! May your heart always discover new reasons to smile! Hi, my name is Colleen O’Hara and I’m the illustrator of My Heart Smiles. Today, as I sit in the living room, watching the rain fall and green up the yard, “Nature nuzzles me.” It’s June 4 in the Upper Peninsula of Michigan and the lilacs have finally bloomed. Lake Superior looms in the fore ground of the picture window, covered in a silvery mist. As the gardens drink from the sky the plants are “Nourished with Love”! This is my normal!!! I am wishing you a “nifty” day! It’s been a while since I’ve blogged. I guess just waiting for the right inspiration. TODAY I received a wink from the Universe! OMG!! THIS IS THE BEST DAY EVER!!!!!!!! This morning, I went out to feed the birds and while I was standing close to one of the feeders, a chickadee landed right at face level at the feeder. I wondered to myself… Could this be THE day? I put sunflower seeds in my hand, held it straight out and mentally talked to the birds letting them know it was ok to come into my energy field. It’s safe. It’s ok to land. You are welcome to take seeds from my hand…AND THEN, the beautiful little chickadee, flies out and lands on my hand, hangs onto my finger, and takes a seed and flies off to the cedar branch! I held my breath in Joy! YES, AND…It flew back, landed on my finger again and takes another another seed! This time it stayed, ate it, and then took another seed before flying off to a branch. Another chickadee is in the cedar tree watching all this. The next thing I know, the second chickadee flies in, holds onto my finger, walks up my finger, and eats a couple seeds too! Do you know how good it feels to feel the touch of a wild little bird’s foot holding onto your finger? Have you ever experienced the bliss of nature’s precious little bird walking up your hand? I will remember this day forever! My heart is blessed! Nature nuzzled me and I am nourished with love! Needless to say…my heart is full of humongous smiles on this Nifty day! Our First Children’s Event Sponsorship! Our hearts are smiling! 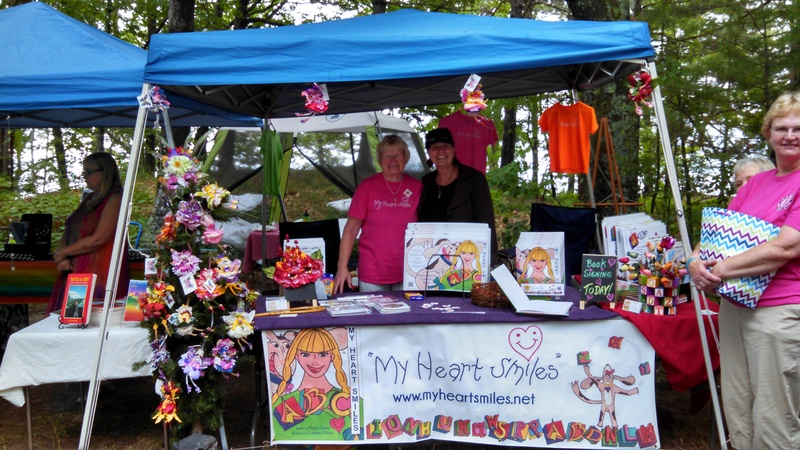 We are thrilled to announce that this spring My Heart Smiles is one of the sponsors of the Grant Henriksen Memorial Fund booth in the Children’s Activity Area at The UP Builder’s Show at the Superior Dome in Marquette on March 4-6th, 2016. Giant legos! Face painting! Crafts! A Bouncy House! Arts…Coloring! Pages to color are from My Heart Smiles Humongous Coloring Book! Yes,AND… there will be an expanded sitting area for parents…Ahhhhh! The Grant Henriksen Memorial Fund (GHMF)is a nonprofit fund devised to help families of the Upper Peninsula whose child is battling cancer, requiring treatments and/or surgeries outside of the U.P. Families have many different types of expenses, including the possible loss of income during their child’s battle against cancer. This fund was originated because of the Henriksen’s personal experiences in fighting their own battle against childhood cancer. For over two years the Henriksen family traveled back and forth from the UP to Ann Arbor and Madison for weekly chemotherapy treatments and multiple surgeries. They found that being able to take their child to dinner or a movie or a simple family outing, such as an arcade, became extremely important during this time. Most times it was necessary to take lodging to and from hospital stays. All of these expenses are not technically considered medical expenses, but the Henriksen’s did consider them to be necessary. Without help from others in the community, their family struggles would have been even greater during the most difficult time imaginable. All of the money raised for the Grant Henriksen Memorial Fund money is donated without stipulations on how the funds are used and is entirely confidential. All they ask is that the family you are requesting the funds for will use the money for what is best for the child and his/her family. The GHMF sells NO Oscar T-Shirts and Golf Shirts year round. However, the primary source of money raised comes in during The Annual GHMF Golf Scramble. For more information about the fund, how you can help someone you may know or to participate in this year’s scramble contact The Grant Henriksen Memorial Fund at (906) 250-0051 or (906) 271-0400, email: alwaystracy@charter.net. Link: http://mqtbx.org/ Look under the “Children’s Area” tab. Happy Birthday Fest Week, Colleen! My Heart Smiles, illustrator, Colleen Mary O’Hara, is in her Joy! Celebrating her Birthday Fest Week! Spontaneously Sparkling and Super Spunky! MY HEART SMILES at Outback Art Fair this coming weekend! The excitement is building! The weather forecast looks AWESOME! The view along the Lake Superior shoreline is BREATHTAKING! The artists are CREATIVE beyond compare! The deals are DELIGHTFUL! EVERYONE ENJOYS this EVENT! Come join the FUN! A book is a gift that keeps on giving! My Heart is Smiling plenty big!